Donors Have A Right To Ask Questions Of Candidates For Office, Don't They? 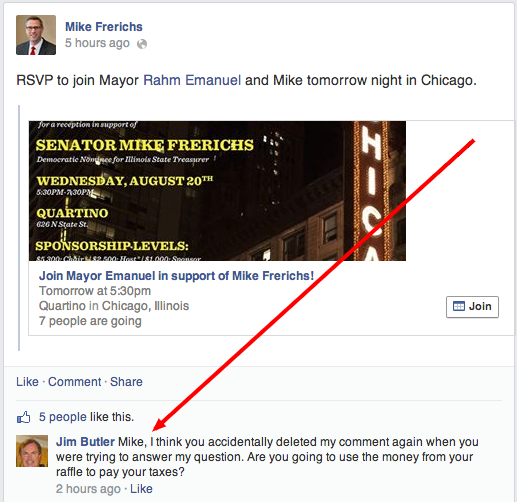 In addition to spelling and compliance challenges, we'd posit that comment moderation isn't one of the strong suits of the Mike Frerichs for Illinois Treasurer campaign. Earlier this week, they were too busy crowing about a fundraiser they were throwing to worry about what donors were asking them about the money they were raising. Mike, I think you accidentally deleted my comment again when you were trying to answer my question. Are you going to use the money from your raffle to pay your taxes?